The South Korean government is known to be considering sending a group of inspectors to BMW headquarters in Germany as part of efforts to resolve a series of incidents involving the German cars catching fire in South Korea. 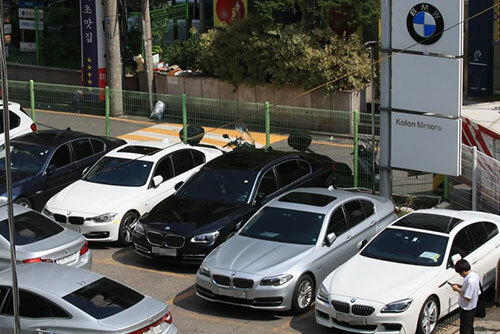 Rep. Hong Chul-ho of the major opposition Liberty Korea Party(LKP) said in a statement on Wednesday that the Land, Infrastructure and Transport Ministry revealed the plan in response to an inquiry he submitted regarding recent accidents involving BMW sedans. According to the lawmaker, the ministry said its officials and civilian experts are conducting a joint inspection to determine the causes of the auto blazes, and if needed, it will send a group to carry out field inspections at BMW's headquarters and factories. He also quoted the ministry as saying that it is considering introducing punitive damages against car manufacturers and creating a legal basis to punish them if they are caught attempting to hide or understate auto defects. The lawmaker claimed that field inspections in Germany are inevitable, citing concerns there could be more unknown defects in BMW cars apart from the alleged problem with the exhaust gas recirculation(EGR) coolers. Hong also pointed to speculation the carmaker may have known about the defects in cars sold in South Korea since two years ago or earlier.